If you are a visual learner, start by taking a look at our video tutorial. If not, please read past the video. 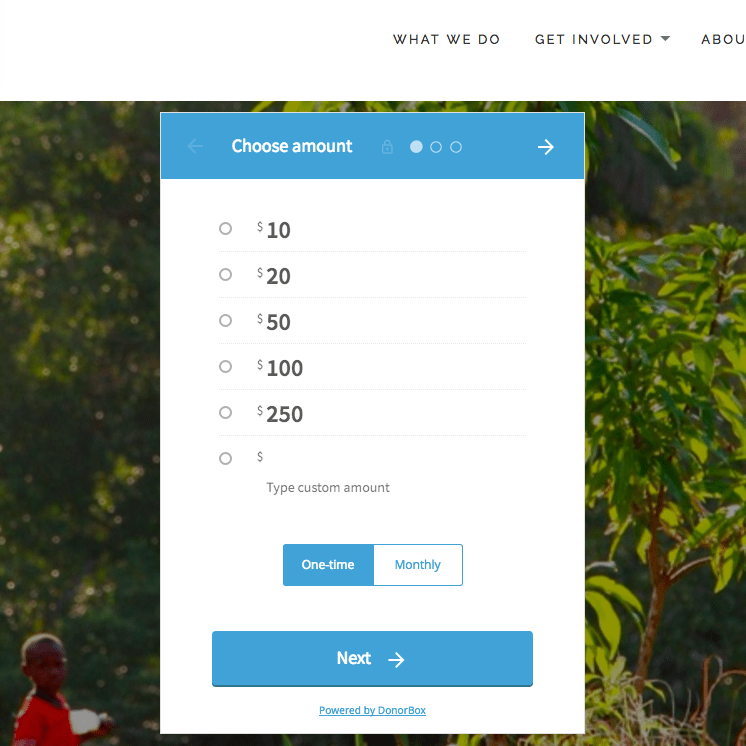 It takes just 4 steps to go from creating a Donorbox account to deploying your first donation form. It’s really simple! Ready? Let’s go! It takes only a few minutes to create a Donorbox Org Account. We’ve put together a helpful guide to take you through each step. We don’t require any uploaded documentation from you to register. Just enter your email address, password and a few other relevant details. Our goal is to get you donation-ready as fast as possible. Donorbox supports 2 payment processors: Stripe and PayPal. Stripe is our main payment processor, and we can’t recommend it enough – it’s safe, efficient, and cost-effective. But PayPal is great, too! They are both highly regarded for their data security. To maximize your donations, it’s best to sign up for both Stripe and PayPal so that donors can choose their preferred method of payment. Donorbox does not hold any donations for any period of time. All donations get processed directly via Stripe and PayPal. If you are only planning to connect 1 payment processor, we highly recommend that it be Stripe. It gives donors a wider variety of payment options like debit/credit cards and ACH. Google Pay and Apple Pay are also both supported (due to Apple’s strict domain matching security measure, Apple Pay will only work on your Donorbox-hosted secure donation page). Both Stripe and Paypal charge 2.2% – 2.9% + $0.30 per donation. If you are a registered 501c3 nonprofit, contact moc.e1555706067pirts1555706067@tifo1555706067rpnon1555706067+sela1555706067s1555706067 to get discounted Stripe fees and apply at PayPal’s Nonprofit Centre. Donorbox is free if you receive less than $1,000 in donations for a month. If you reach $1,000 for a month, we charge a small platform transaction fee of 1.5% for the month’s donations. Check out our pricing guide for details of what your payment processing and Donorbox fees may look like. 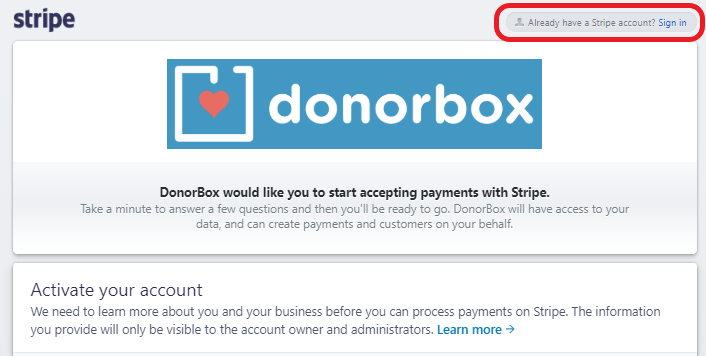 To connect a Stripe account, simply go to your Donorbox dashboard and click the “Connect with Stripe” button. This will redirect you to a Stripe account creation form. If you already have a Stripe account, click the “Sign In” link and enter your login details. Once you fill out and submit the form, you will be redirected back to your Donorbox dashboard, and you’ll be ready to go! 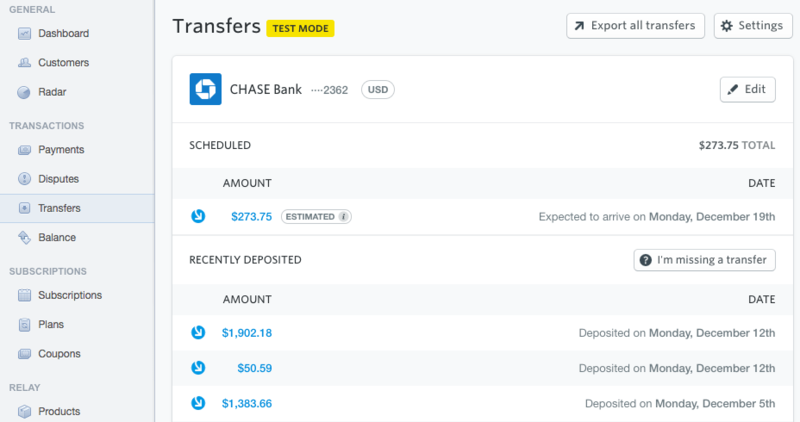 Stripe will automatically transfer your funds from your Stripe account to your bank account based on the transfer schedule listed on your dashboard. In the US and Australia, transfers will be automatically completed every two business days. However, your first transfer may take a little longer (around 7 days). In most other countries, transfers are set to be completed every 7 business days. For more information about the exact transfer time in your country, click here. You can also access a summary of your past and upcoming transfers on your Stripe dashboard, as shown below. Donorbox has implemented some measures to strengthen our connection with PayPal. Personal PayPal accounts are no longer supported. Only PayPal business accounts can connect to Donorbox. Simply go to your Account Settings by clicking the Account tab at the top of your Donorbox dashboard page. Then, select Payment Methods on the left. Enter your email address in the PayPal field, click “Connect” and you’re all set! Unlike Stripe, PayPal requires you to initiate the transfer of your funds from your PayPal account to your bank account. After you’ve initiated the transfer, the funds will arrive in your bank account within two to three business days. To begin taking in donations, you will need to create a campaign form. To do so, click the “Create a Campaign” link on your Donorbox dashboard. This will open up our Form Builder page. Start by naming your campaign and entering your campaign description to let your donors know exactly what they are contributing to. If necessary, you can also change the language or currency of your form. You will be guided through each step of building your campaign form. 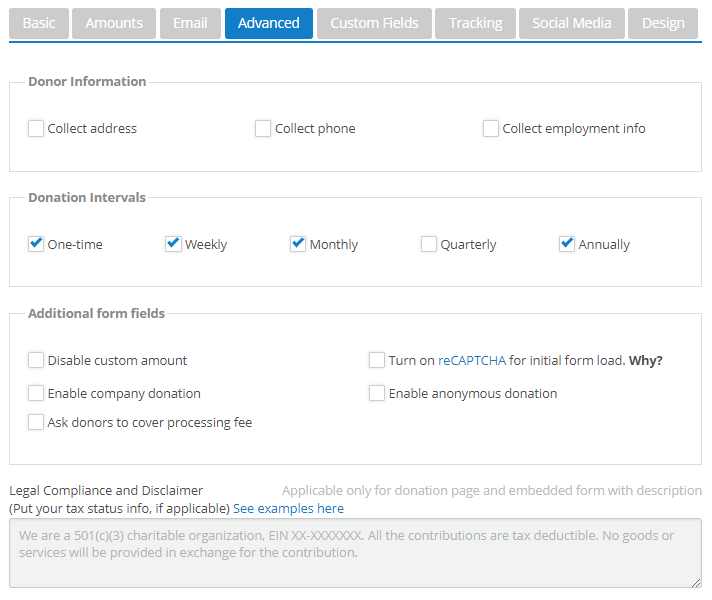 They’re quite customizable – add pre-filled donation amounts to your form, and edit your automated email receipts. You can also add custom questions and enable different recurring intervals. Check out our Features Page for a full list of what our awesome campaign forms can do. 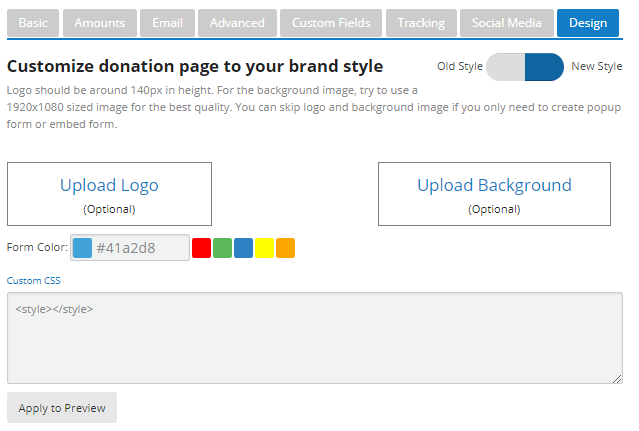 You can change the color of your donation form, inject custom CSS, and add logos and a hero image to match your website’s branding. Once you have gone through the editor and you’ve customized it to your liking, click “Save & Preview”. This will save the changes and you’ll see a live version of your form, ready to start accepting donations! Don’t worry, you don’t need any programming experience. We will auto-generate all the required code for you to simply copy and paste. If you use specialized web builders such as WordPress, WIX, Squarespace, Weebly, and others, our platform-specific installation guides may be useful. Now let’s look at our 4 options for making your Donorbox form go live. 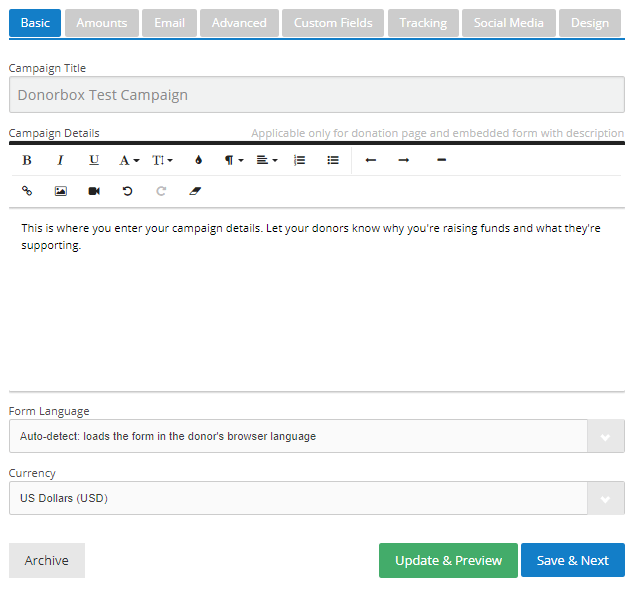 Donorbox automatically creates a beautiful donation page for your campaign, hosted on our SSL-secure servers. This saves you from having to install SSL yourself. There is no extra charge for this, no matter how many campaigns you create. The other great thing about our Donorbox-hosted donation pages is that you don’t even need your own website. We host the page for you. Your donors can start donating immediately without you going through the hassle of first developing a whole website. But, if you already have a website, that’s cool too! Another advantage of using a Donorbox donation page is that you’ll be able to accept donations via Apple Pay. Our servers have already been certified and approved for use by Apple. How convenient is that? To direct donors to this donation page from your website, click the “Link to Donation Page”, which you will find next to your campaign name. This will open a page containing the URL to your Donorbox donation page, including the text that will be hyperlinked. There are also customizable settings that you can edit. The URL will self-adjust as you make these edits. 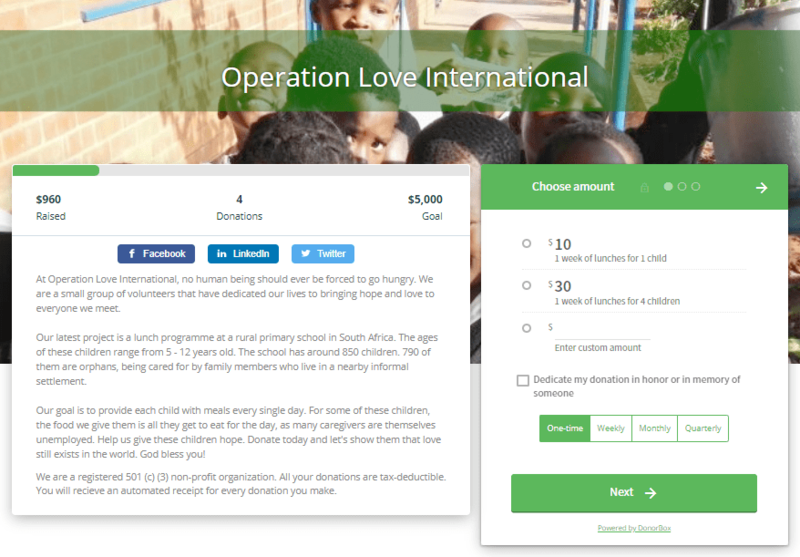 The second option is to embed the donation form directly to your website. Donorbox will generate the embedding code – you just need to copy and paste. Click the “Embed Form” link, found next to your campaign in the Dashboard. You will be taken to a page containing the embed code and all the different settings you can adjust. You’ll notice the embed code change as you adjust the settings. You can also preview your form so that you know exactly how it will look once it’s on your website. When you are happy with your form, simply copy the code and paste it into your website editor – it’s that easy! If you are embedding the donation form, your website needs to be SSL-enabled. Our third option is the popup modal form. 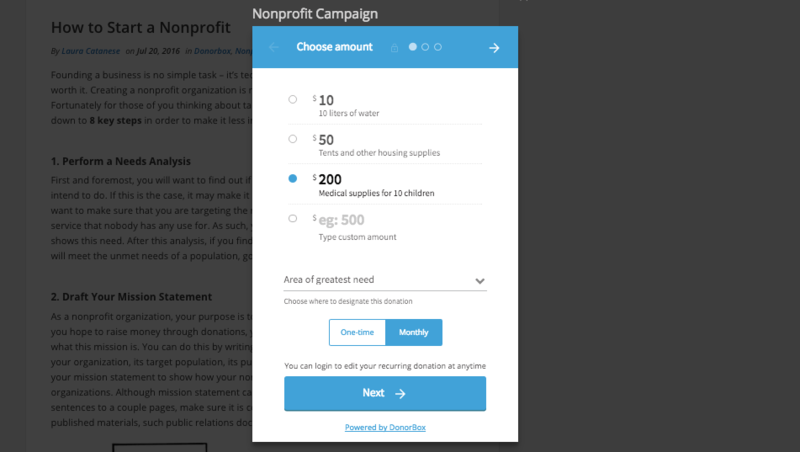 Instead of redirecting your donors to a separate donation page, you can make a donation form pop up, as an on-screen overlay, when someone presses the Donate button. For details on how to install this, please check out our pop-up installation guide. Just like with embedding the donation form, if you want to use the popup modal you will need to install SSL on your website. You can use the Donorbox Donate button anywhere to take donors to your Donorbox-hosted donation page. It works great within emails too, if you want to include a Donate button as part of the email message. To do this, simply click the “Donate Button” link, located to the right of the “Embed Form” button. Here, you have many options for you to customize the donate button so that it meets your preferences. For example, choosing the size and color of the button. Simply copy the code for the URL and paste it into your website/email editor, and you’re good to go! And that’s it for our Getting Started Guide! We know you’re going to love using Donorbox. Feel free to check out our other manuals (linked below) for more assistance. You can always drop us an email at any time – we’d love to help. It would really be nice if you had a video tutorial on this. It’s taking a lot longer than I anticipated. Is it possible to reset my stripe information? It won’t take a different stripe account than the one I signed up with. We are a non-profit organization (Pk-12 school) based in Dominican Republic with an alumni community around the world. Could we set up an account to receive donations using Donorbox having our bank based in the Dominican Republic? We have accounts in USD and in DOP on the same loca bank in the Dominican Republic. When I got the confirmation email it says “Hi Naples Cat Alliance”. I only volunteer for them once a week. I have nothing to do with the day to day running, staffing, buying supplies, donations etc. I do apologize for any misunderstanding as I thought the site was asking who I was donating money to.